When celebrities do commercials, their persona is normally the center of attention in promoting whatever the product is. But for the new (and oddly excellent) fleet of KFC ads, former Saturday Night Live performer and current announcer Darrell Hammond put on a wig and fake mustache and became the classic pitchman Colonel Harlen Sanders. Check out the old-fashioned awesomeness in the video below. Let’s see. We’ve got a record player, we’ve got a classic telephone model, a mock Time magazine mirror, and a use of the phrase “boy howdy.” Colonel Sanders is back, America! And with him is a band of mandolin players (who serve as the subject of another commercial). He’s slow in getting used to certain aspects of modern America like cargo shorts and double-sided tape, but the taste of the company’s fried chicken is all he’s really worried about. 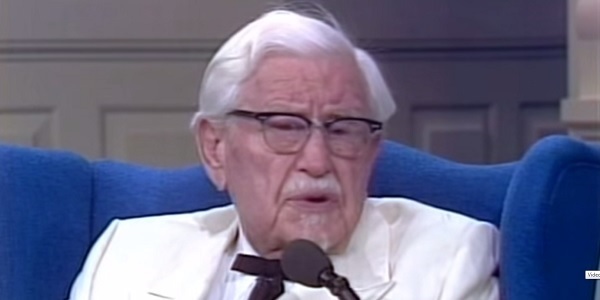 Colonel Sanders is the man who founded the hugely successful fast food chain when he was over 60 years old, after years of selling fried chicken in a roadside restaurant. And his rebooted self is apparently so proud of his product that he’s willing to walk all over a city, handing out chicken pieces to everyone in sight, while singing a modified version of Ivor Cutler’s “I Need Nothing, I’ve Everything I Need (Doughnut in My Hand).” It’s eerie, and I can’t imagine anyone would readily take fried chicken in a car-to-car way, but the tune stays with you. All in all, I really dig Hammond as the new Colonel Sanders. He’s got the face for it, he’s got the awkward chuckle, and he looks as dashing as ever in that suit. Not as dashing as his Celebrity Jeopardy version of Sean Connery, naturally, but it’s still striking. For comparison’s sake, here’s what the real Sanders looked like in 1979, when he was 88 years old. If you head to the KFC website or YouTube page, you can find another pair of ads, one involving a stage play covering the origins of the restaurant. And believe me, it’s even weirder than the ones above in many ways. I can’t imagine ever seeing any of these actually playing on TV in any capacity, but here’s hoping they find a way to air it alongside a marijuana commercial in the states where that’s legal. Seems like a winning combination to me.